Aim: This study aimed to evaluate the doctors' perspectives in using tools for diagnosis, prescribing medications, and devices for the treatment of asthma in Algeria. Methods: Data were collected from randomly selected physicians, pediatricians, allergists, and pulmonologists through a questionnaire-based survey in 12 cities and 60 rural locations across Algeria. Results: Of the 213 doctors who responded to the survey, >90% doctors attended an average of 20 asthma patients daily. Peak flow meter was used by 69% doctors for diagnosis and by 93% for monitoring of asthma. Spirometer was used by 76% doctors for diagnosis of asthma. Budesonide (86%), fluticasone (46%), and beclomethasone (40%) were the most prescribed inhaled corticosteroid (ICS) by doctors. Formoterol/budesonide was the most preferred ICS/long-acting β2-agonist (LABA) (72%), followed by salmeterol/fluticasone (57%) for asthma treatment. Salbutamol was preferred by 93% doctors as reliever medication. ICS was the preferred controller in mild asthma (76%), and ICS/LABA combination in moderate (74%) and severe asthma (80%). Most doctors (94%) preferred pressurized metered-dose inhalers (pMDIs) with (46%) or without spacer (48%) for their asthma patients. About 83% doctors believed that pMDI with spacer would show a better outcome in asthma, over pMDI alone. Continuous exposure to allergens/smoking (73%) and incorrect inhaler technique (66%) were the most common reasons for uncontrolled asthma. Conclusion: The use of diagnostic tools in asthma was found to be adequate among the doctors in Algeria. Most of the doctors managed asthma in accordance with the global initiative for asthma guidelines. Spacers were found to be less prescribed in regular treatment, despite having good awareness about its better outcomes. Asthma is the most prevalent chronic respiratory disease diagnosed in adults and children. Today, asthma is considered as one of the leading causes of morbidity and an important cause of mortality  and is estimated to be affecting approximately 300 million people worldwide. A significant percentage of work and school absenteeism can be attributed to asthma. The burden on health-care utilization and costs is substantial., The prevalence and impact of asthma in Algeria are sparsely known, although very few epidemiology data are available which are relatively old. An epidemiology survey conducted in Algeria in 1985 reported that the cumulative prevalence of asthma was 1.34%, was more commonly seen in males under 20 years and 40% patients had a family history of asthma. In 2009, another survey conducted in the North African regions of Algeria, Morocco, and Tunisia reported that the prevalence of asthma was 3.45% in Algeria. The prevalence rates between both the genders were comparable; nevertheless, it was highest in children under 16 years and in elders above 54 years. Global data epidemiologists predict that there will be approximately 161 million lifetime prevalent cases of asthma by 2023, with an overall growth of 17% over the next 10 years. The global initiative for asthma (GINA) recommends treatment of asthma with various inhaled corticosteroids (ICSs) and their combination with long-acting β2-agonists (LABAs) as a controller therapy for the underlying inflammation and to reduce the future risk of exacerbations. Spirometer and peak flow meter are recommended for the diagnosis as well monitoring of symptoms of asthma. However, as we observe the trends of clinical practice, regular use of these instruments is limited, and it largely depends on the doctors' understanding about the disease. Knowledge of physician perspectives is an essential element on which interventions are based to improve the quality of care to the population. There is not much data on the doctors' perception toward diagnosis and management of asthma in Algeria. Therefore, we conducted this survey to better understand the clinicians' practice patterns, prescription of medicine, and device recommendations in Algeria. A survey questionnaire was initiated to enroll pulmonologists, internal medicine practitioners and general practitioners practicing obstructive airway disease in Algeria. Qualified pulmonologists, respiratory specialists, allergists, and pediatricians from different practice settings such as government hospitals, private hospitals, academic institutions, and private clinics were identified from 12 cities and 60 rural locations across Algeria. A total of 250 doctors participated during a period of 3 months between April 2015 and June 2015. The questionnaire consisted of 17 multiple-choice closed-ended questions, in which some questions had single answers and others were multiple. One question was based on Likert scale. The questionnaire was designed to target the different aspects of demographics, diagnosis, management, and emergencies in patients with asthma. The filled-in questionnaires were collected from the doctors and sent in for statistical analysis by trained personnel at the Chest Research Foundation, Pune, Maharashtra, India, and results were evaluated for each individual question. This survey was not sponsored in any means and the doctors participated voluntarily. Of the 250 doctors approached, 213 (>75% were respiratory physicians and other 25% included allergologists and pediatricians) responded to the survey partially or completely. 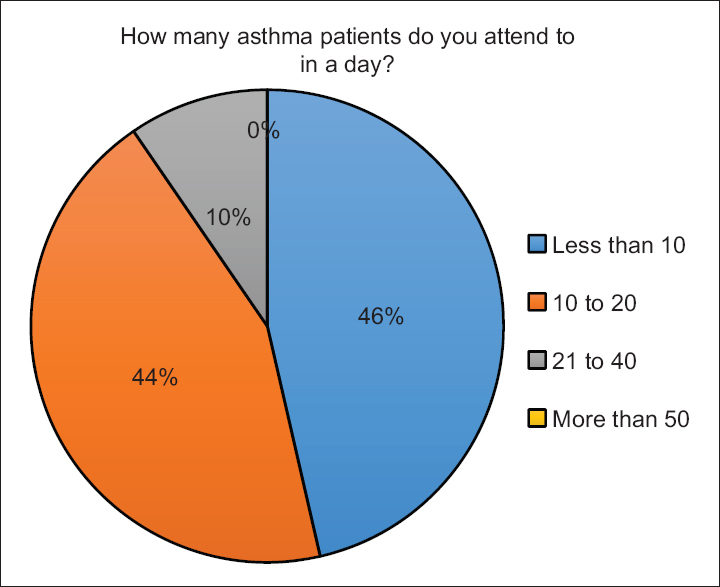 Of the 209 doctors who responded to the question, 97 (46.41%) doctors attended to <10 asthma patients, 92 (44.02%) doctors attended to 10–20 asthma patients, and 20 (9.57%) doctors attended to 21–40 asthma patients in a day [Figure 1]. One hundred and fifty-eight (74.18%) doctors reported that patients with asthma that generally visit them are above 25 years of age and 82 (38.5%) doctors treat more of pediatric (<12 years) asthma patients [Table 1]. In Algeria, spirometry was used by approximately 76% doctors for the diagnosis of asthma [Figure 2]a. The peak flow meter was used by approximately 70% of the doctors for the diagnosis and by 93% doctors for the monitoring of asthma [Figure 2]b. 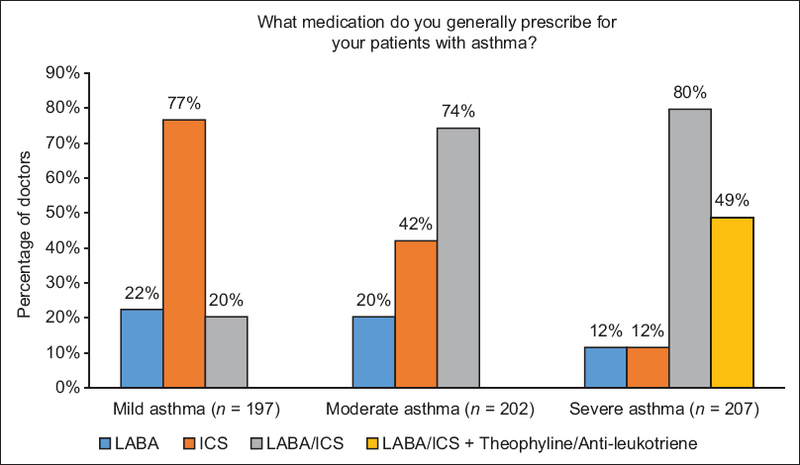 Most of the doctors (77%) preferred ICS for the treatment of mild asthma whereas ICS/LABA was the treatment of choice for both moderate (74%) and severe asthma (80%). LABA is prescribed by 22% doctors in mild asthma, 23% in moderate asthma, and 12% in severe asthma [Figure 3]. 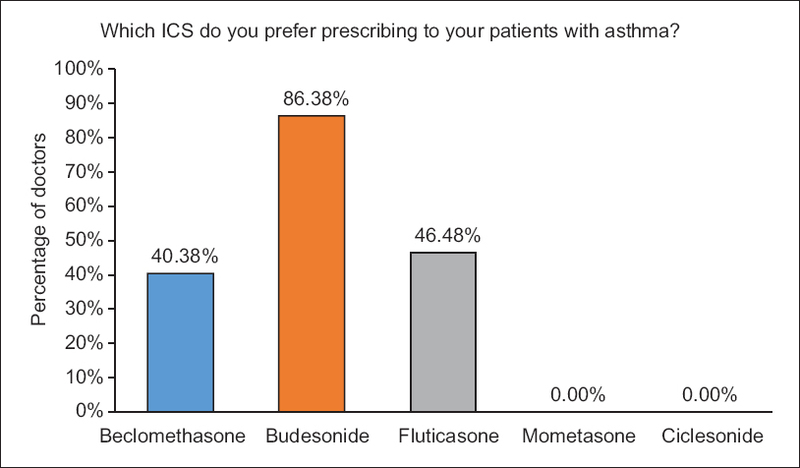 Approximately 86% of the doctors prescribed budesonide as a preferred ICS treatment, followed by fluticasone (46%) and beclomethasone (40%) for the treatment of asthma [Figure 4]. The participant doctors preferred budesonide/formoterol the most (approximately 72%), followed by fluticasone/salmeterol (57%) for the controller medication in asthma [Figure 5]. Approximately 93% doctors preferred salbutamol as a reliever therapy. 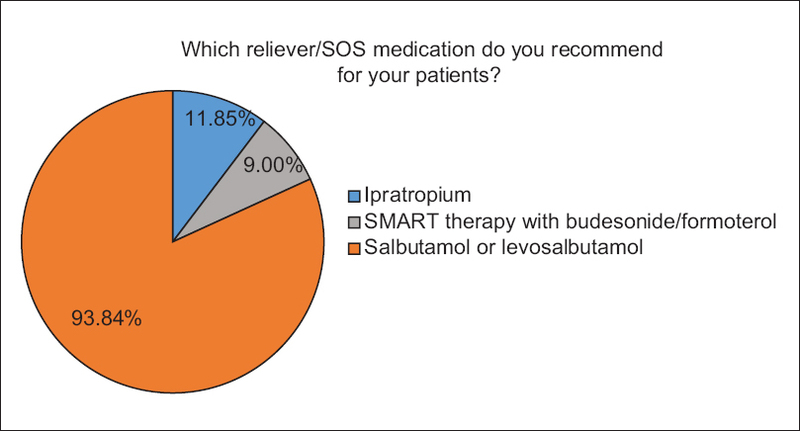 However, some doctors are prescribing ipratropium (11.85%) and SMART therapy with budesonide/formoterol (9%) [Figure 6]. Around 83% doctors prescribed inhalation therapy to >60% of their asthma patients. It was perceived by about 74% of the doctors that around two-third of their patients were apprehensive to use inhalers. 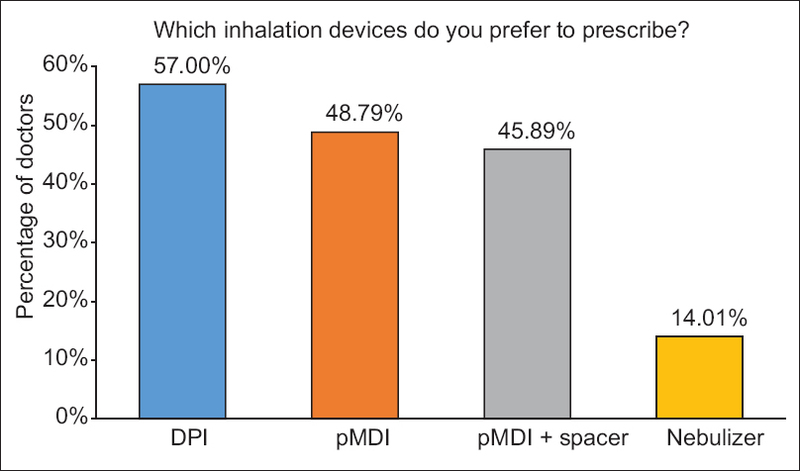 Approximately 94% of the doctors preferred pressurized metered-dose inhalers (pMDIs), with or without spacer, and 57% preferred dry powder inhalers (DPIs) [Figure 7]. The majority (approximately 82%) of the doctors believed that using a spacer with pMDI would show better clinical outcomes in their patients with asthma. About 94% doctors perceived that >40% of their asthma patients adhere to the prescribed inhalation therapy. Almost 98% doctors thought that more than half (up to 60%) of their asthma patients were uncontrolled. 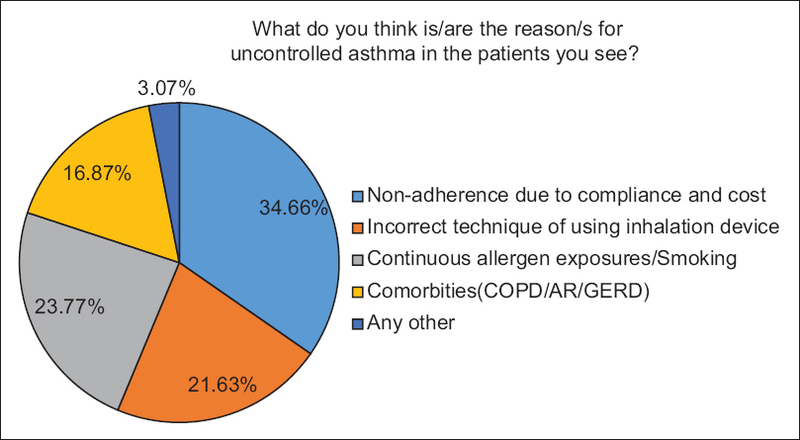 Doctors perceived “nonadherence due to compliance and cost of medications” (35%), “continuous allergen exposure/smoking” (24%), and “incorrect technique of using inhalation devices” (22%) as the common reasons for uncontrolled asthma in their patients [Figure 8]. The current survey was done in Algeria to understand the doctors' preference for the diagnostic tools such as spirometer and peak flow meter and management strategies for treating their patients with asthma. We tried to capture and analyze the important aspects of the daily practice of doctors when treating their patients with asthma in terms of choice of drugs and devices. In Algeria, peak flow meter and the spirometer are well-accepted tools to measure the lung function in patients with asthma. Per the GINA guidelines, a spirometry reading can diagnose the disease and determine the severity stage of the diagnosed lung disease. A spirometer measures parameters such as forced expiratory volume in 1 s, forced vital capacity, and tidal volume. In this survey, it was observed that approximately two-third of the doctors make adequate use of spirometer for diagnosis. Peak flow meter measures the peak expiratory flow rate and can be utilized as a good monitoring tool to monitor disease control and can predict exacerbations in patients with asthma. PFM is also used as an alternative diagnostic tool when the use of spirometer is not optimal due to factors such as inadequate time, high cost, lack of availability, and insufficient knowledge. In Algeria, almost all doctors advise their patients to use peak flow meter for the daily monitoring of their lung function at home. Interestingly, many doctors use PFM as a diagnostic tool. GINA guidelines recommend the regular and daily use of low-dose ICS along with as-needed SABA, for improving asthma symptoms and reducing the risk of exacerbations, hospitalization, and death. For patients already using ICS and still having poorly controlled or uncontrolled asthma, the combination of LABA/ICS is recommended. In accordance with these recommendations, majority (77%) of the doctors in Algeria preferred ICS the most for their patients with mild asthma. For moderate-to-severe asthma, the most preferred therapy was LABA/ICS combination. Doctors also preferred to prescribe add-on therapies such as antileukotrienes or theophylline to their patients with severe asthma. We could observe that the choice of treatment shifts from mono ICS to combination therapies as the patient moves higher on the severity scale [Figure 3]. In asthma, the use of LABA is recommended only in combination with ICS. However, as seen in a study in the UK, over a course of 1 year, under one-third of the asthma patients were prescribed LABA monotherapy and 20% of these patients were exposed to serious risks associated with LABA monotherapy. Similar results were found in Algeria, approximately 20% doctors still use LABAs for the treatment of asthma despite the availability of LABA/ICS combination in the country. One of the possible reasons for this malpractice is believed to be the practice of prescribing LABA and ICS in separate inhalers. Once symptom control is achieved by LABA alone, patients fail to adhere to ICS therapy. This is a serious issue and should be addressed urgently. Budesonide is the most preferred ICS for treatment of asthma. Regular use of budesonide is known to reduce the rate of severe exacerbations and poorly controlled asthma days by >50%. For patients already using budesonide, addition of formoterol improved variables such as need of oral corticosteroids, hospitalizations, and morning PEF. 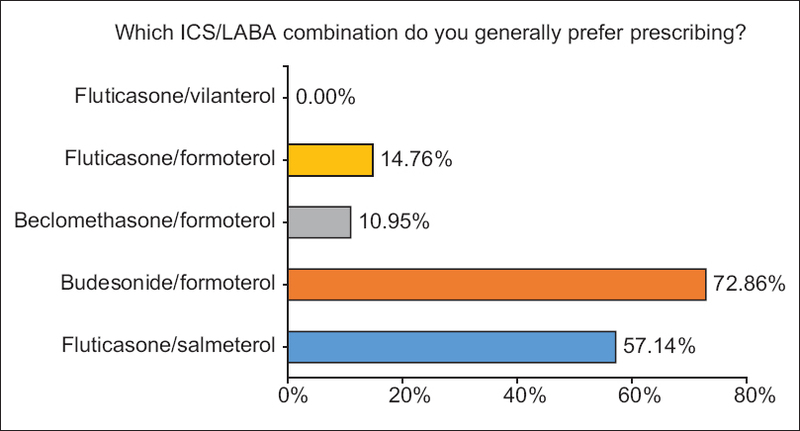 Budesonide/formoterol is the most preferred combination in Algeria. It has shown good clinical outcomes in terms of reduction in number of exacerbations leading to hospitalizations and prolongation of time to first severe exacerbation. It is also recommended to use it as a maintenance and reliever therapy (SMART concept). Salbutamol is the most widely prescribed reliever; however, ipratropium is also prescribed by 11% doctors even though it is not recommended in asthma. Inhalation devices used for patients with asthma include DPIs, pMDI with or without spacer, breath-actuated inhalers, and nebulizers. pMDIs are the most preferred and prescribed devices around the world., and studies have shown their efficiency in delivering variety of drugs for asthma management. In Algeria too, pMDIs are widely prescribed; nearly half the doctors prescribe pMDI alone, despite more than two-third of the physicians believing that using spacer with pMDI would provide better outcomes. This difference in their belief and actual practice could be attributed to the availability of certain drugs only in the DPI devices. Symptom control and risk reduction are the key goals of asthma management. Achieving these goals require a cumulative effort of the physician and patient along with the right medication in a right device through which it is administered. However, despite being recommended by guidelines, treating asthma patients with inhalation therapy remains a challenge for the health-care providers. Reasons for apprehension about using an inhaler can be multiple social unacceptance, no record or track of remaining doses, unable to learn the inhaler technique as well as cost factors. Moreover, in the opinion of doctors in Algeria, patients were found to be very apprehensive about committing to inhalation therapy. Per the data from Algeria in 1996, patient compliance for oral medication was 79% whereas, for inhaled therapy, it was 54%. The results of the current survey demonstrate that the scenario has not changed much even today. Approximately 83% of the doctors advised inhalation therapy to only two-third of their patients. Economic burden of asthma was also found to be very high in Algeria in 2000, where the per patient annual drug cost for long-term treatments was between 32 USD to 92 USD depending on the severity of asthma. Usually, patients assess themselves as adequately adherent to the therapy, considering that a few missed doses would not make any difference. On the same lines, in this study, most of the doctors perceived that “non-adherence due to compliance and cost” is the most common cause of uncontrolled asthma in the patients. Incorrect inhalation technique is also seen as a contributing factor to nonadherence. In doctors' opinion, every 1 of 5 asthma patients in Algeria demonstrated incorrect inhalation technique. Another major reason for nonadherence can be the negligence and forgetfulness. Dose counters can contribute in improving adherence in such cases which can eventually help improve the symptoms. In addition, patient education and repeated device demonstration and training can also help in improving compliance. In Algeria, the use of tools such as spirometer and peak flow meter for the diagnosis and monitoring of asthma is good. LABAs are still used by around 20% of the doctors in the treatment of asthma, despite availability of ICS and ICS/LABA combinations. Budesonide is the most preferred ICS; budesonide/formoterol and fluticasone/salmeterol are the most preferred ICS/LABA combinations. Most of the doctors in Algeria believe that nonadherence due to compliance and cost is the most common cause of uncontrolled asthma in the patients. The authors thank the doctors who participated in the survey and the field team of Cipla Ltd. The authors were assisted by Nimit Mehta for collection of the data and Dr. Urvi Khorani (Cipla Limited.) for preparation of manuscript. This survey was funded by Cipla Limited, India. Global Initiative for Asthma GINA; 2017. Available from: https://ginasthma.org/2018-gina-report-global-strategy-for-asthma-management-and-prevention/. [Last accessed on 2018 Jun 17]. Al-Busaidi N, Habibulla Z, Bhatnagar M, Al-Lawati N, Al-Mahrouqi Y. The burden of asthma in Oman. Sultan Qaboos Univ Med J 2015;15:e184-90. Sánchez J, Estarita J, Salemi C. Rhinitis and asthma as a cause of absenteeism and poor work/school performance in a population from Latin-American tropic. Rev Alerg Mex 2016;63:32-40. Ismaila AS, Sayani AP, Marin M, Su Z. Clinical, economic, and humanistic burden of asthma in Canada: A systematic review. BMC Pulm Med 2013;13:70. Belhocine M, Ait-Khaled N. Prevalence of asthma in a region of Algeria. Bull Int Union Tuberc Lung Dis 1991;66:91-3. Nafti S, Taright S, El Ftouh M, Yassine N, Benkheder A, Bouacha H, et al. Prevalence of asthma in North Africa: The asthma insights and reality in the Maghreb (AIRMAG) study. Respir Med 2009;103 Suppl 2:S2-11. Cross D, Nelson HS. The role of the peak flow meter in the diagnosis and management of asthma. J Allergy Clin Immunol 1991;87:120-8. Thorat YT, Salvi SS, Kodgule RR. Peak flow meter with a questionnaire and mini-spirometer to help detect asthma and COPD in real-life clinical practice: A cross-sectional study. NPJ Prim Care Respir Med 2017;27:32. Morales DR. LABA monotherapy in asthma: An avoidable problem. Br J Gen Pract 2013;63:627-8. O'Byrne PM, Barnes PJ, Rodriguez-Roisin R, Runnerstrom E, Sandstrom T, Svensson K, et al. Low dose inhaled budesonide and formoterol in mild persistent asthma: The OPTIMA randomized trial. Am J Respir Crit Care Med 2001;164:1392-7. Patel M, Pilcher J, Pritchard A, Perrin K, Travers J, Shaw D, et al. Efficacy and safety of maintenance and reliever combination budesonide-formoterol inhaler in patients with asthma at risk of severe exacerbations: A randomised controlled trial. Lancet Respir Med 2013;1:32-42. Rubin BK, Fink JB. Optimizing aerosol delivery by pressurized metered-dose inhalers. Respir Care 2005;50:1191-200. Mitchell JP, Nagel MW. Valved holding chambers (VHCs) for use with pressurised metered-dose inhalers (pMDIs): A review of causes of inconsistent medication delivery. Prim Care Respir J 2007;16:207-14. Woodcock A. CFCs and inhalers. Lancet 1994;344:182-3. Fabbri LM, Piattella M, Caramori G, Ciaccia A. Oral vs. inhaled asthma therapy. Pros, cons and combinations. Drugs 1996;52 Suppl 6:20-8. Aït-Khaled N, Auregan G, Bencharif N, Camara LM, Dagli E, Djankine K, et al. Affordability of inhaled corticosteroids as a potential barrier to treatment of asthma in some developing countries. Int J Tuberc Lung Dis 2000;4:268-71. Bender B, Wamboldt FS, O'Connor SL, Rand C, Szefler S, Milgrom H, et al. Measurement of children's asthma medication adherence by self report, mother report, canister weight, and doser CT. Ann Allergy Asthma Immunol 2000;85:416-21. Lindsay JT, Heaney LG. Nonadherence in difficult asthma – Facts, myths, and a time to act. Patient Prefer Adherence 2013;7:329-36. Kaur I, Aggarwal B, Gogtay J. Integration of dose counters in pressurized metered-dose inhalers for patients with asthma and chronic obstructive pulmonary disease: Review of evidence. Expert Opin Drug Deliv 2015;12:1301-10.